High resolution dispensing systems and equipment are designed to provide high-capacity performance while at the same time offering safe consumer operation and longer service life. These systems are being currently deployed mostly in electronic applications such as gasketing, encapsulating, electronic assembly, shielding, hot melt molding, and plastic bonding. The integration of automation in various industries such as automotive, oil and gas, aerospace and defense, and fluids is set to contribute to the growth of the global high resolution dispensing systems and equipment in the coming years. The need for control, accuracy, and customization across these end-user industries is expected to be a major factor boosting the market during the forecast period. The global high resolution dispensing systems and equipment market is slated to grow from a value of US$1.8 bn in 2015 to US$3.0 bn by 2024, registering a steady CAGR of 6.3% therein. Volume-wise, the market is expected to expand at a modest 3.2% CAGR from 2016 to 2024. Based on type, the global market has been bifurcated into automatic and semi-automatic dispensing systems. Automatic dispensing systems acquired a larger share in the market in 2015 in terms of revenue. Manufacturers of high-resolution dispensing systems have embraced the automatic variants owing to the many advantages associated with them. Automatic dispensers also help prevent dispensing in the wrong location, thereby increasing the overall productivity, reducing costs, and lowering the chances of part failure. These dispensing systems are also easier to implement and have proven to be cost-effective in the long run. By application, the global market has been classified into electronics and others. The application of high resolution dispensing systems and equipment in electronics dominated the market in 2015. The electronics application segment comprises adhesive and sealant dispensers, glue dispensers, liquid material dispensers, and powder dispensers. The usage of adhesive and sealant dispensers in the electronics industry is currently widespread and they directly contribute to not just the production of electronics products but also to their longevity and long-term operation. Adhesives are mainly used for wire tacking, bonding of surface-mount components, and encapsulating or potting components in the electronics industry. During the forecast period, rising demand in application areas such as medical, aerospace and defense, and solar is expected to bolster the growth of the high resolution dispensing systems and equipment market. Europe acquired the dominant share in the global high resolution dispensing systems and equipment market in 2015, accounting for more than 35% in terms of revenue. The market in Europe has evolved over the past decade and is expected to record strong growth in the coming years owing to considerable investments and technological advancements in the electronics industry in the region. The market is primarily influenced by growth in countries such as France, Italy, Spain, Germany, and Sweden. Asia Pacific is a lucrative market for high resolution dispensing systems and equipment by value as well as volume. Countries such as China, Taiwan, Singapore, and Hong Kong are home to an increasing number of consumer electronics manufacturing companies. China is the main hub as far as the manufacturing and assembly of electronics components is concerned. The export and import value of the electronics produced is China is also on a surge. Taiwan’s integrated circuit industry is well established with a vertically integrated chain. Electronics is the one of the prime industries fueling the economic growth of Singapore. 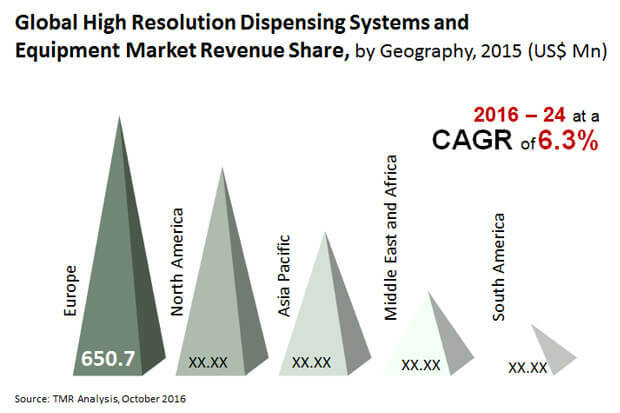 These countries are anticipated to continue boosting the high resolution dispensing systems and equipment market in Asia Pacific. Some of the major players operating in the high resolution dispensing systems and equipment market are Nordson Corporation (U.S.), AptarGroup, Inc. (U.S.), Dover Corporation (U.S.), Franklin Fueling Systems Inc. (U.S.), Jensen Global Inc. (U.S.), Graco, Inc. (U.S.), Musashi Engineering Inc. (Tokyo), Mycronic AB (Sweden), Illinois Tools Works, Inc. (U.S.), and Besi (Netherlands). High resolution dispensing systems are high end dispensing equipment that are ideal for electronic applications and are capable of dispensing drop sizes as precise as ~300um-400um and above. Dispensing technology has come a far way in the last 50 years and the technological advancements have included the change from manual to semi-automatic or upgrade to robotic dispensing from the semi-automatic one. A key trend that has been observed in the recent years is the reduction in the drop size which is a key driver in the precision micro fluidic markets for the precision dispensing applications. A surge in demand for accuracy and precision coupled with the increasing usage of high resolution dispensing systems and equipment in electronic applications is driving the growth of the global market. These systems are being deployed in electronics to increase the productivity of electronic assembly, molding, shielding and encapsulating applications. High precision adhesive and sealant dispensing systems help to precisely dispense a diverse range of products for electrical and electronic component manufacturing, that include thin-line, intricate dispensing for highly miniaturized personal communication devices and also foam-in-place gasketing for comparatively large consumer electronics. Additionally, rapid technological advances are fueling the global market growth. The introduction of robot dispensing, and technologies such as manual load and unload robotic dispensing system and fully integrated robotic dispensing system are augmenting the growth of the market. Thus, the conjoint effect of all these drivers is set to bolster the growth of the global high resolution dispensing systems and equipment market in the coming years. Based on type, the global market has been segmented into semi-automatic dispensing systems and automatic dispensing systems. By application, the global high resolution dispensing systems and equipment market has been broadly classified into electronics and others. Electronics application has been further sub-divided into adhesive and sealant dispensers, glue dispensers, liquid material dispensers, powder dispensers and others. By geography, the high resolution dispensing systems and equipment market has been segregated into North America, Europe, Asia Pacific, Middle East and Africa and South America. The report includes the market attractiveness analysis of the electronics applications for offering and insight into the major application area of the high resolution dispensing systems and equipment. An exhaustive analysis of the market dynamics of the global market that is inclusive of the market drivers, restraints and opportunities is covered under the purview of the study. Therefore, the global high resolution dispensing systems and equipment market report offers and extensive study of the market along with providing the forecast of the market in terms of revenue (USD Million) and volume (Units) from 2016 – 2024. The key players in the global high resolution dispensing systems and equipment market have been competitively profiled across the five broad geographic regions. This competitive landscape is inclusive of the various business strategies adopted by these major players and their recent developments in the field of high resolution dispensing systems and equipment. Some of the major players operating in the high resolution dispensing systems and equipment market are: Nordson Corporation (U.S.), AptarGroup, Inc. (the U.S.), Dover Corporation (the U.S.), Franklin Fueling Systems Inc. (the U.S.), Jensen Global Inc. (the U.S.), Graco, Inc. (the U.S.), Musashi Engineering Inc. (Tokyo), Mycronic AB (Sweden) Illinois Tools Works, Inc. (the U.S.), Besi (Netherlands) among others.